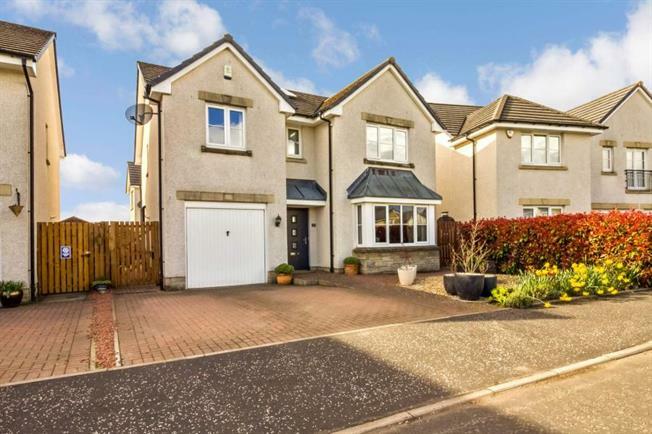 4 Bedroom Detached House For Sale in Stirling for Offers Over £320,000. UNDER OFFER Deceptively spacious detached four bed (two en-suites) executive villa upgraded and extended by the current owners to include a luxurious upgraded contemporary fitted kitchen, utility room and stunning individually designed sun room extension with wood burner and Bi-Fold doors. This ideal family home was originally constructed by Stewart Milne and enjoys an enviable position with open aspect to front. The property is further enhanced by the addition of Solar Panels, quality flooring throughout the ground floor and numerous integrated appliances including coffee machine, induction hob, Combi oven and granite worktops. The versatility and quality of finish can only be appreciated by viewing with the accommodation currently comprising of a generous front facing lounge, stylish open plan dining kitchen which in turn leads into the sun lounge extension to rear. The property is further enhanced by a further utility room and convenient ground floor W.C. The upper landing allows entry into four bedrooms with the master and guest rooms both enjoying en-suite shower rooms. There is a further family bathroom. The property is gas centrally heated and double glazed. Garage and mono-block driveway provide parking to front. The rear gardens have been landscaped for low maintenance and enjoy feature raised beds.